At my house, Sunday afternoons are for Netflix marathons, huge plates of nachos, and the comfiest of pants. And as with most Sunday’s this year, it’s snowing today. Again. Seriously, isn’t it Spring! Not in Canada friends. Not in Canada. So this Sunday, I’m rocking the world of comfort to the max with an Arrested Development marathon (for the 357 thousandth time – for real, how great is that show!) and this delicious dessert. Simple to put together, and absolutely delicious. Feel free to mix out the fruit to whatever suits your fancy – blueberries, strawberries. Delicious options for days and days. Crack your eggs into a medium bowl, and whisk em up. Add your yoghurt, vanilla, and olive oil, and mix well. In a separate bowl, sift in your flour, baking powder, sugar, and salt. Combine your wet and dry ingredients and mix well. Fold in your raspberries. Pour your batter into a greased loaf pan, and smooth the top of the loaf. Bake for 50-55 minutes, until a toothpick comes out clean. Allow the loaf to cool in the pan for 20 minutes before turning out onto a drying rack. In a medium bowl, combine your icing sugar and lemon juice, and whisk until smooth. Pour the icing over your loaf, and spread all over. 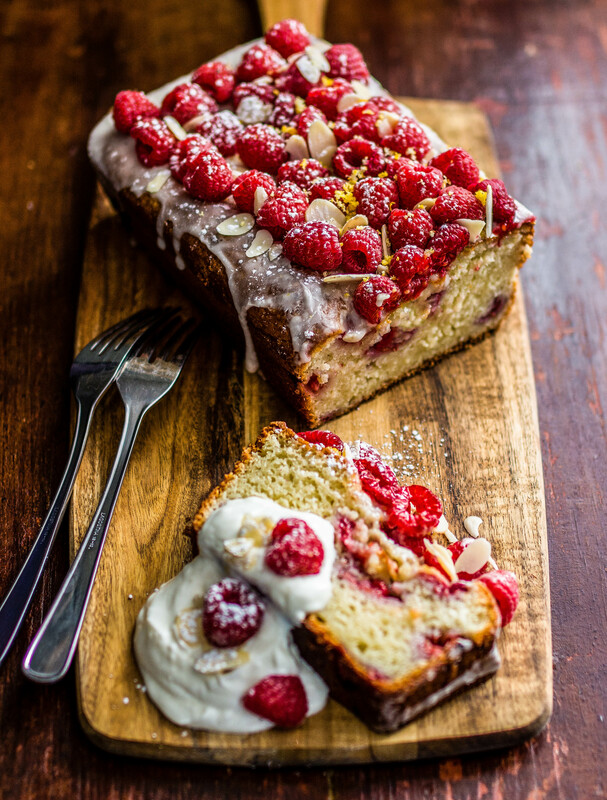 Top with your fresh raspberries, almonds, and lemon zest. 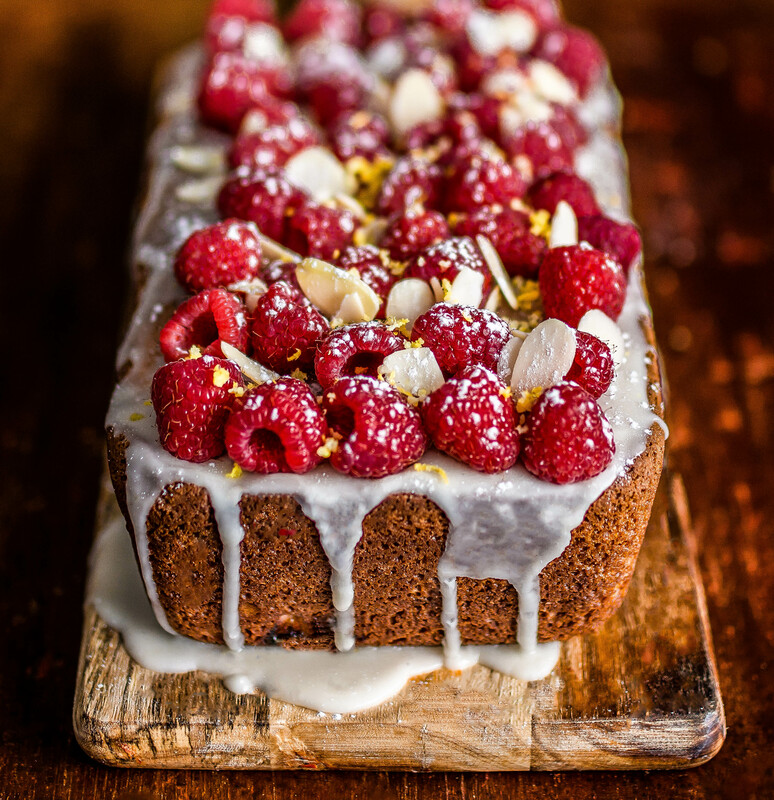 Leave to rest for 10 minutes so your raspberries will set up in the icing sugar. Top your piece with a dollop of yoghurt & some more fresh berries and almonds. I recently did this and it is SO YUMMY. It’s the best recipe for loaf that I know. Specially delicious with the glaze. 100% recommended. Can’t wait to try other new recipes! Awesome – so glad you liked it!!!! May I ask what the difference is between icing sugar and powdered sugar? Can this be made the day before? If so, should I wait to add the glaze till right before, but still make it in advance? If not, do you add the icing right after you remove it from the pan onto the cooling rack? You think it would turn out the same if I used frozen raspberries in the batter? Yes, you’d be fine. The frozen ones will just marble more through the cake. Thanks so much. That’s great! !